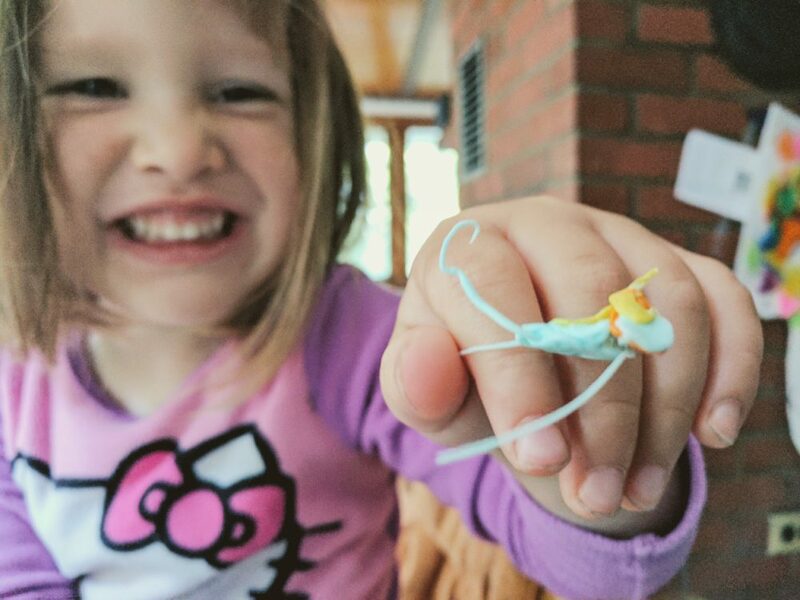 What 3D pen is made for little hands? 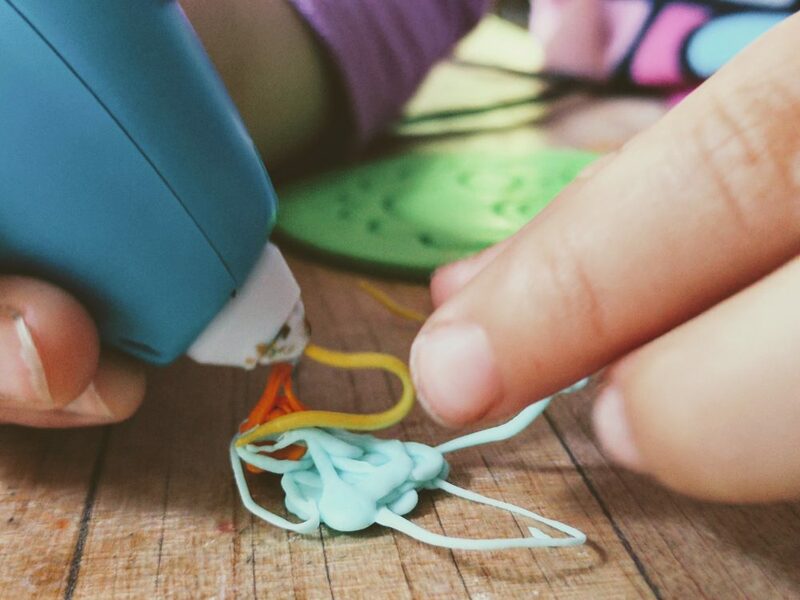 Check out our 3D pen review to learn about the 3Doodler start! 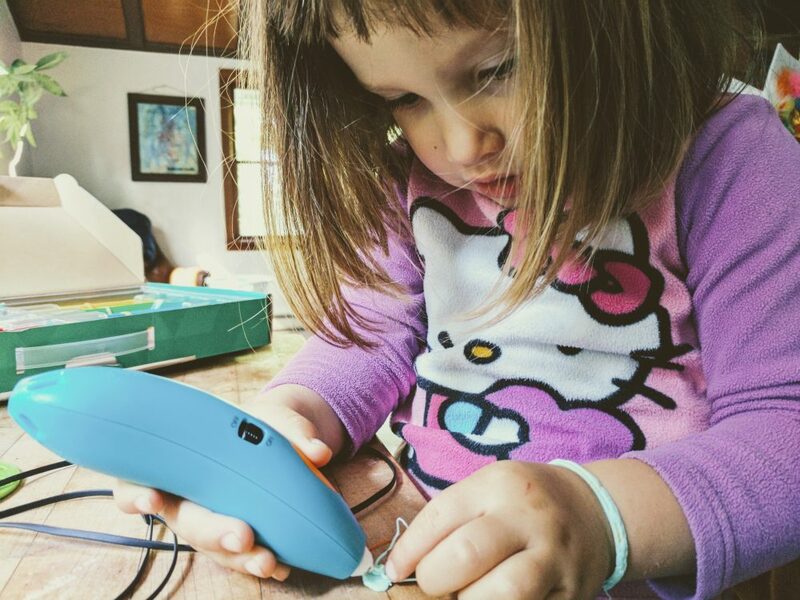 The 3D pens from 3Doodler showed up on our doorstep earlier this week and unsurprisingly, our girls have fallen in love with the ability to create little objects and plastic string while even these old worn down parents are having fun creating little sculptures and efforts. 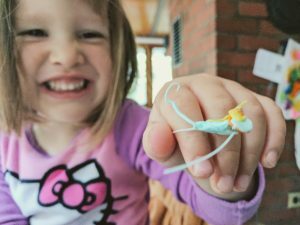 We got the 3Doodler Start because of its lack of hot parts, and my desire to use them in the classroom with all ages of kids. Granted, so far our pieces of art kind of look like the concentrated work of a hummingbird trying to hold a paintbrush, but it’s not about the final product right?!? The 3Doodler Start pens themselves are pretty great, and perfect for the novice or young crafter. My 3 year old can touch the end without any fear of burning (not true of any hot glue gun I’ve seen, or most other 3d pens on the market) and my 6 year old has taken to creating her very own first fidget spinner from a template we found online (you can find your own fidget spinner here), but I’ll get back to that later. There are tons of 3Doodler projects I already have dreamed up, bridge building, sculptures, integrating circuits and more. The 3Doodler Start pens are big for the girl’s hands, probably the size of a medium pickle that hasn’t sat shrinking in the fridge because everyone got tired of the 5-pound bottle (not like that would happen in our house…). It has a slight curve, I guess to make it hold easier but definitely not pen-like and I’ve found the curve gets a little in the way of my ability to see my artwork. It could be the pen is more bulbous in order to give the heating element more room to cool, making it so not-burning-fingertips-and-tears friendly, but I don’t know for sure. 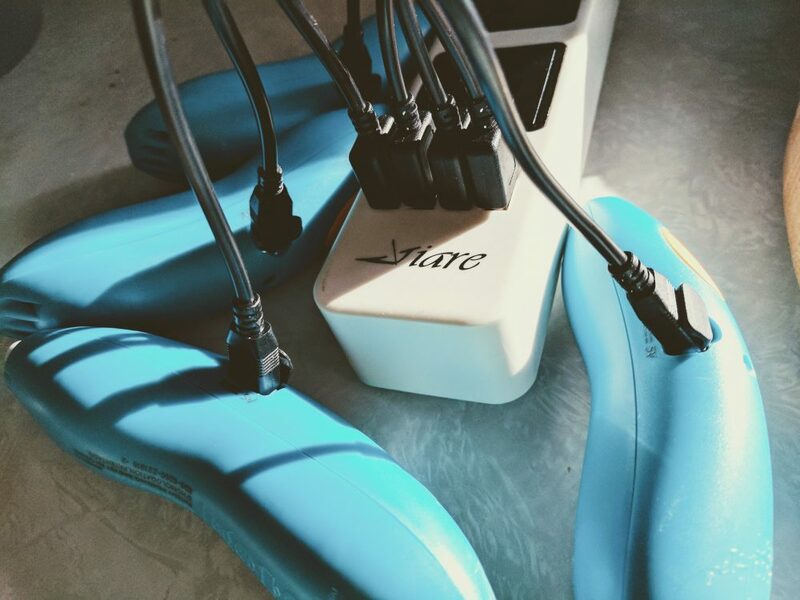 The pen has a small on/off switch and a larger toggle button which takes it from standby to active, active being the small motor inside pushing the sticks of plastic through. It’s pretty basic, you turn the 3Doodler pen on, wait until the green light stops blinking, only a few seconds but still long enough to require questions of ‘when is it going to be ready? ?’ and once it shows up solid, you’re ready to go. You insert a stick of plastic and press the large button once to activate the motor. The plastic then feeds through the protected hot tip and you’re on your way to doodling 3d objects. Can I mention how amazing that protection is, no tears! Because you’re feeding the pen with sticks as opposed to a continuous line of plastic, you have to monitor how much is left, although when its time for a new stick the motor will have nothing to drive against and you’ll hear that its ready. I like the ability to switch colors but I do wish there was a way to combine two or three colors in the pen to create your own blends. We’ve experimented a little with cutting up the sticks and alternating them so they blend a little bit at the tip but it’s pretty imperfect and our littlest really wants some pink. I have to say, their 3Doodler creations have all come out amazing. So far we haven’t run into any safety issues. The heating element is well-insulated and Dad it touched for long periods as a test (trust your own judgment and experimentations, his tolerance is pretty high). 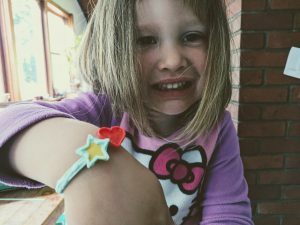 I even ran the melted plastic from the pen along my wrist to create a bracelet, and while hotter than you would create a baby bottle, it was not painful. I would still closely supervise anyone who doesn’t listen or communicate very well. One important thing to note, the pens create lots of small plastic bits, especially when there are younger ones participating. If you have little ones who don’t mind ingesting small, brightly colored objects that kind of look like candy at times, keep them away! It’s not uncommon for these little tidbits to scatter all over the work table and floor. The cost of the 3Doodler Start pens wasn’t too bad although I can see how the cost of the sticks will add up pretty quickly with all the ‘experimentation’ a 3 year old can throw at them. However, as long as they are exploring and learning I think it is an investment well worth it. Each stick almost costs a quarter but you can put together a fun little design for about 4-5 sticks so getting a personalized homemade bracelet + bonding experience for $1 plastic makes sense to me. We bought the EDU 6 pack of pens that comes with 600 sticks of plastic, tons of templates, design books and more for $350 – it was funded by a community grant, but that price point is a pretty good deal for STEM teachers looking to add it into bridge-building projects and other engineering units. You can also start yourself off with one pen and about 150 sticks for $100. Still, the biggest hurdle to the pen is the requirement to purchase 3Doodler refills, instead of using any type of PLA filament that would fit. If you are looking for a less kid-friendly version of a 3D pen, 3Doodler also makes the 3Doodler Create pen, which is a step up in functionality but has a much hotter tip. I also checked out the MYNT3D pen that I really loved, but in the end, when working with young kids that can easily burn I opted for a more user-friendly experience. I hope you enjoyed our 3Doodler Start review! 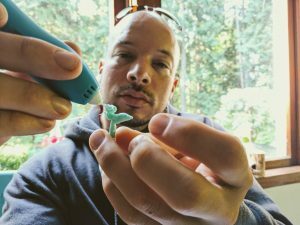 We have other 3D pen reviews too, so make sure to check them out before purchasing your 3D pen.